Sep. 14, 2017. 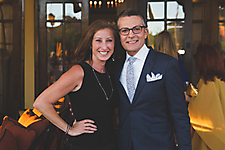 Guests got a first look at dresses hot off the runway from the April New York City market during DREAM Couture Bridal Fashion Show at Omni Scottsdale Resort & Spa at Montelucia, featuring celeb emcee Randy Fenoli from the hit show “Say Yes to the Dress”. The event showcased gorgeous wedding dresses from premiere designers, couture fashion and unique, one-of-a-kind bridal style. Elite wedding professionals and chic designs were also on hand as guests sipped Veuve Clicquot and enjoyed bites from the resort’s Executive Chef Marcos Seville. The extravagant evening ended with a post-dessert reception of fashion and sparkling jewelry viewings.